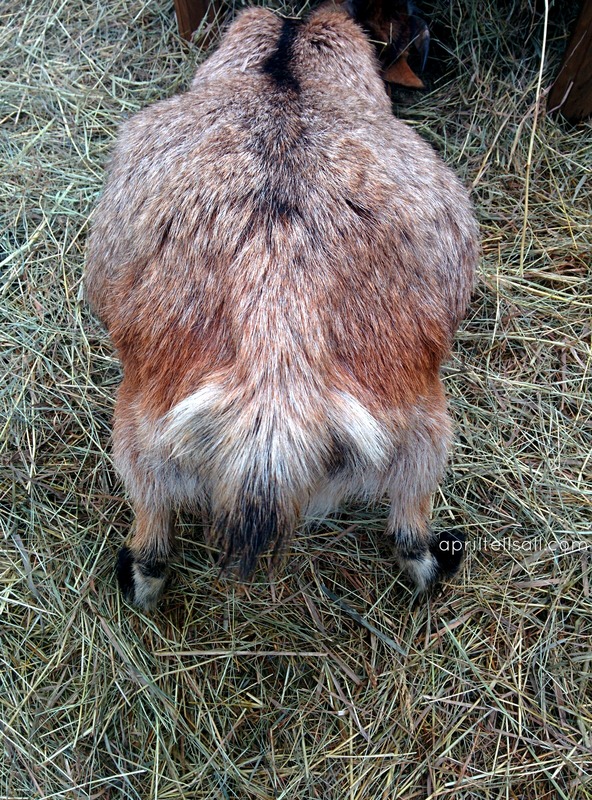 When is my goat going to pop?! I send this question up the heavens multiple times a day when Phoebe starts nearing her due date. Phoebe has this thing where she likes to make me think today is the day! when she reaches day 140. Her tail ligaments go out at about day 137 and then there is groaning, laying down, stretching, head pressing, and udder development for days. And each day I spring into action. I text Hubby about 50 times a day to tell him there’s mucous hanging out! Or she’s moaning! Or I’m sure she’s in labor this time. But then she gives me that look. I swear she is grinning! And then she leaves whatever distressed oh I’m in labor! pose that she was holding and meanders to the hay feeder to eat without a care in the world. Ya she wasn’t in labor. I hate this goat some days. This is our second kidding together. Her as the glowing mom to be, and me as the nervous hand holder… er, hoof holder? Anyways, you would think that I knew her game by now. She had me going for days last year. I was so nervous, as it was her first kidding and mine. I fretted, I freaked, I watched, I paced, and she did nothing. Until finally the day she was due, all was well. There was no playing around. No signs of labor at all. So we made dinner plans. And just as we were about to leave I noticed her hunch ever so slightly. And holy cannoli was her udder ever full! An hour and half later we had our first kid. SO naturally this year you’d think that I would breathe, and know this is all part of her little game. But again I’m freaking, and watching, and pacing, and fretting. I’m nervous, I’m excitied, I just want it over with! 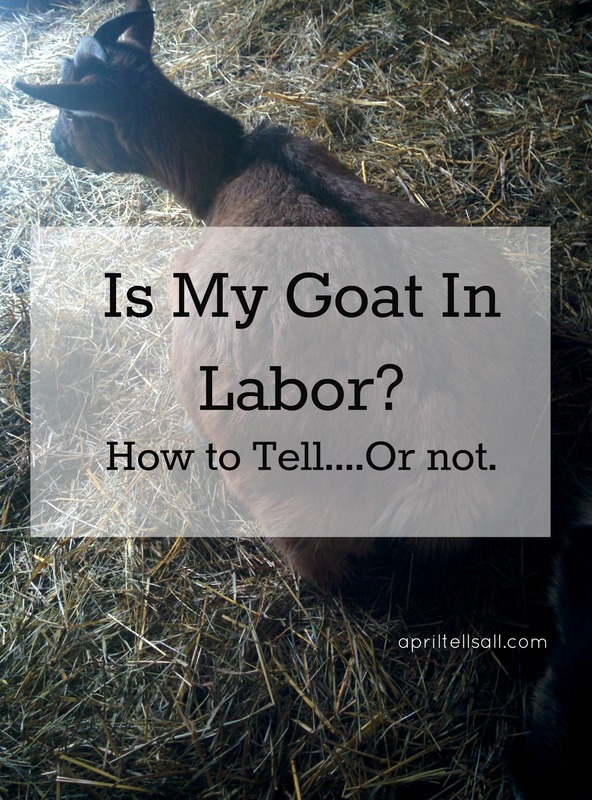 So if you’re in a similar situation here are the signs of labor in a goat. You can read them over, check each one off your list and the dang goat still won’t give birth. Such is life on the farm. The tail ligaments disappear and she starts to look hollow around the tail. This the most trustworthy sign in most goats. Phoebe looses her ligaments at around day 137, so this isn’t a definite sign for her. She’s a Nigerian Dwarf so she kids after 145 days (normally – but 5 days in either direction is in the range of normal as well).Not sure how to tell? The ligaments run on either side of the tail. They will feel like pencils in a non bred goat. They loosen and soften during the pregnancy and will eventually disappear right before birth. The udder will start to fill. I don’t rely on this sign but in some goats it can be one. 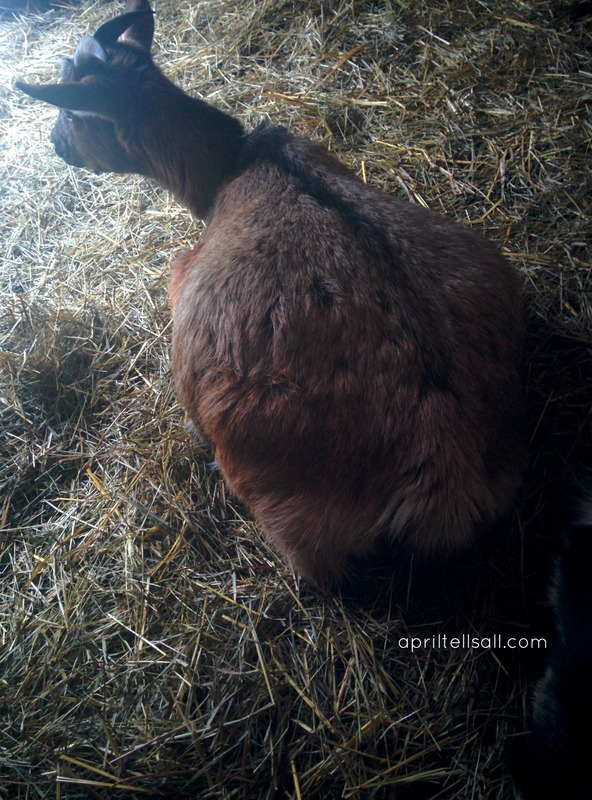 Phoebe’s udder will start to form about a month before she is due. Right before kidding her udder gets good and tight, although some goats don’t have their milk come in until after they’ve kidded. Her udder is there but isn’t full and tight yet. So there probably won’t be kids in the next hour. Pacing, restlessness, or making a nest are all signs. Phoebe will lay down, then stand up, then lay down. She will moan and groan the entire time. Every movement seems to take so much effort! 30 minutes before giving birth last year she was doing the up down up down and was pawing at the ground gathering the straw up around her. She may separate herself from the rest of the herd as well. Most does want privacy when they’re about to kid, or just don’t want to run the risk of being head butted. Phoebe usually lays or stands off by herself and quietly chews her cud. She may have a far off look in her eye as well, or may even be quietly “talking” to herself. A hollow look. Beside the ligaments hollowing out, her hips will start to look hollow as the babies drop down. Her tail head will look raised and her hind end will seem like it drops at a sharp angle. Normally Phoebe has a nice straight top line, but now she seems to drop off at an angle. Her tail head is raised, and she’s starting to look good and hollow. 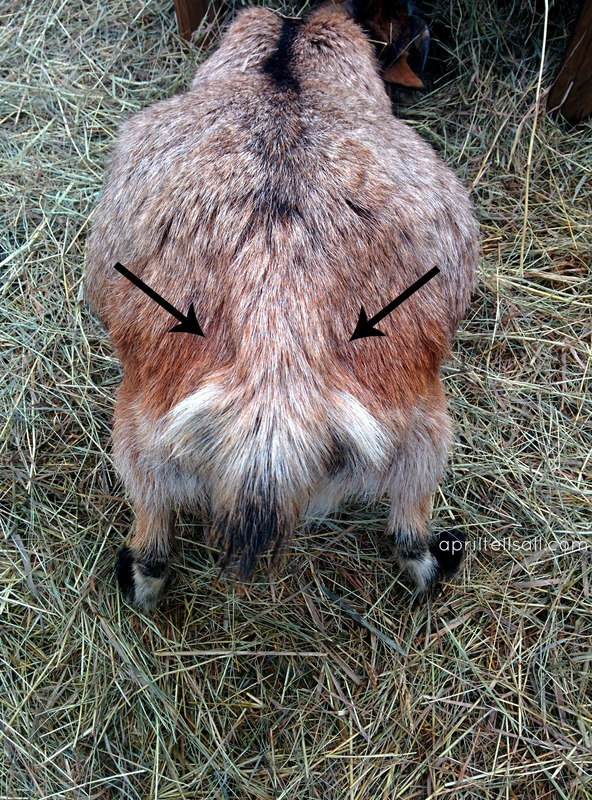 Head pressing is a sign of pain in a goat. They will literally press their head against a fence pole, or tree, or the wall of the stall. This is a main sign for Phoebe. If she’s head pressing it’s almost time. Mucous coming from her lady bits. This isn’t a sure sign as mucous can start as early as a month before she is due to kid. It can range in colour from clear to white to amber. Phoebe is a good model, but every model has their limits. She wasn’t about to pose for a “woohoo” picture, although I can say that she usually starts to “drip” about 3 weeks before she is due. Swelling is also a sign. Her lady bits will look loose and swollen and kind of flabby. Everything is loosening out so it can stretch when it’s baby time. None of these signs guarantee you are going to have kids on the ground soon. But if you’re like me, you need reassurance that things are moving like normal. The easiest way to know when a doe will give birth (roughly) is knowing the date she was bred and marking it on the calendar. 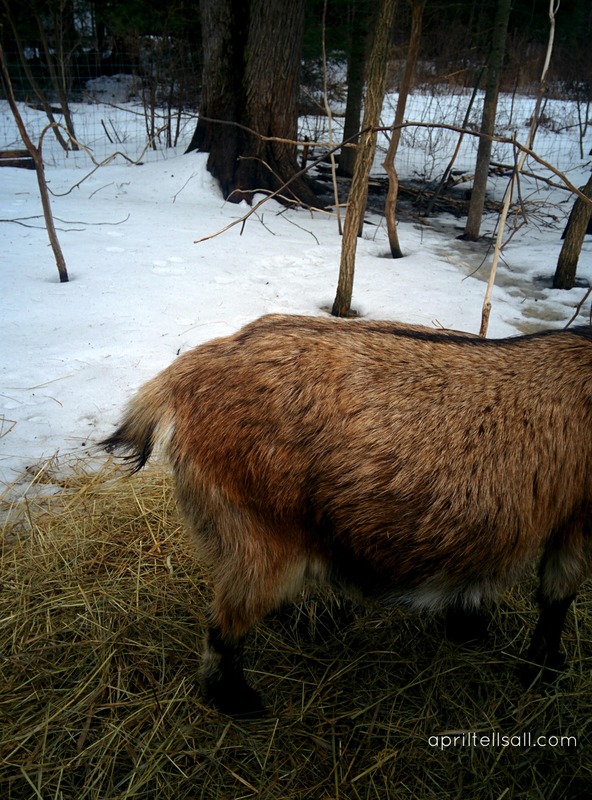 A dwarf goat is pregnant for about 145 days and a standard goat is pregnant for about 150. 5 days in either direction is also normal. So keep watching, keep hoping, and if you’re anything like me keep pacing. I’m trying to stay busy by scrubbing the kitchen sink or eating lots of cookies. Neither are helping. 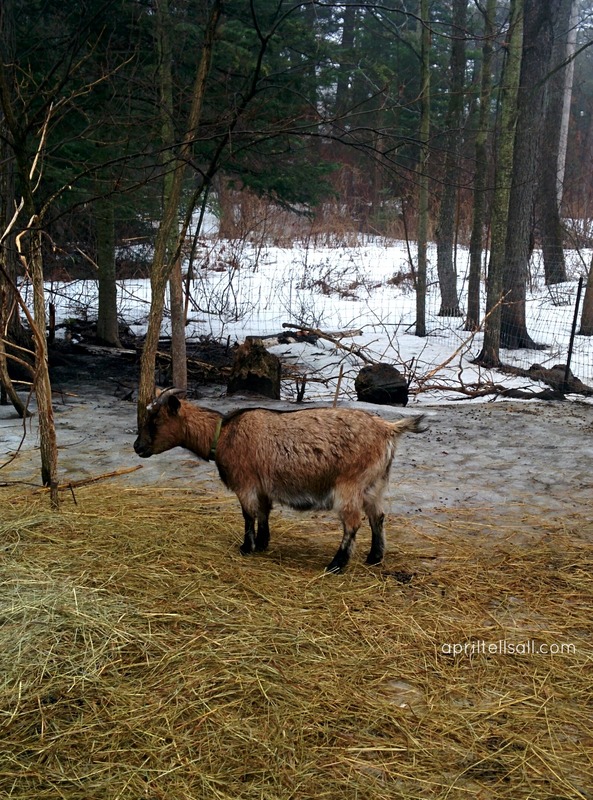 Please send goat birth vibes Phoebe’s way. This article from Fias Co Farms is my go to. 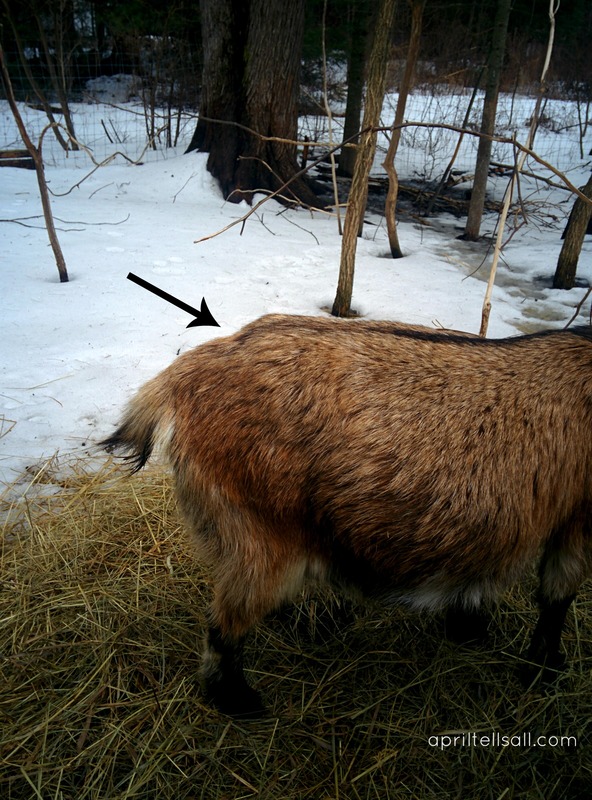 This video from the Goat mentor will help you to find those tail ligaments. 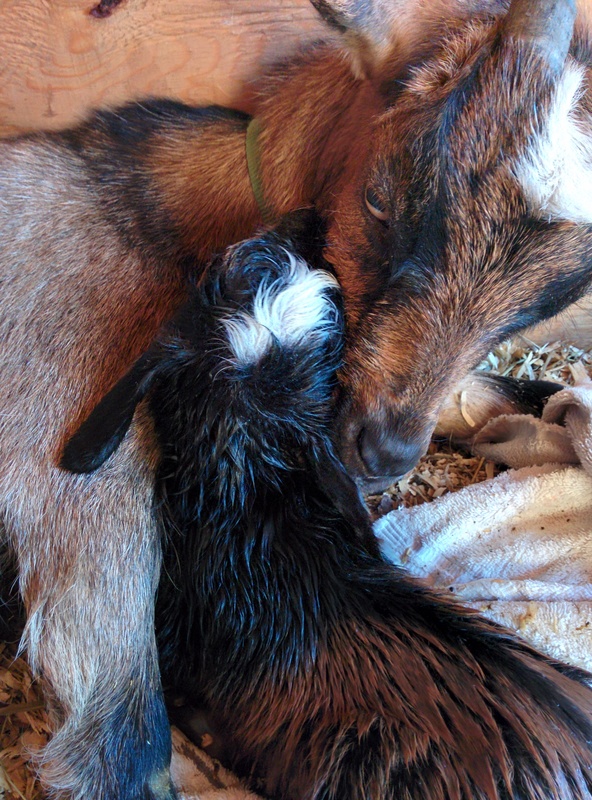 And this video from Nigerian Meadows is my favourite goat giving birth video. I like to know what I’m in for.